The volunteer trainees will be mentors for opiate users seeking help in a program organized by police. AUGUSTA — Shannon Hamilton of Augusta is one of 14 people being trained as “angels” to help shepherd opiate addicts through recovery as part of a new program organized by the Augusta Police Department and area treatment providers. Under the plan announced by Augusta police and others in late August, people addicted to drugs who go to the city’s police station on Union Street seeking help will be funneled to a program that gives them a mentor as well as treatment. It’s one of the ways in which the city and others are seeking to combat the number of recent heroin overdoses. Scarborough police launched such a program in late September. The Augusta program – similar to one operating in Gloucester, Massachusetts – will not begin until the mentors, known as recovery coaches, are trained and treatment providers are lined up. Hamilton said she’s involved with Narcotics Anonymous and Alcoholics Anonymous and her family wants her to be able to help others as well. “I put my 17-year-old through hell because I was using, and he wants me to give back,” she said. Now Hamilton has the time to be trained, she said, having just completed beautician school. “That’s something I never would have done if I hadn’t been in recovery,” she said. Nancee Campbell of Augusta had a similar reason for attending. “I’m here because I’m a recovering individual, a community activist, and very honored to be a part of this exciting, innovative program addressing substance abuse in the community,” she said. Campbell, who was most recently a parish minister at the Unitarian Universalist Church in Stockton, California, said she returned to Maine after she retired. 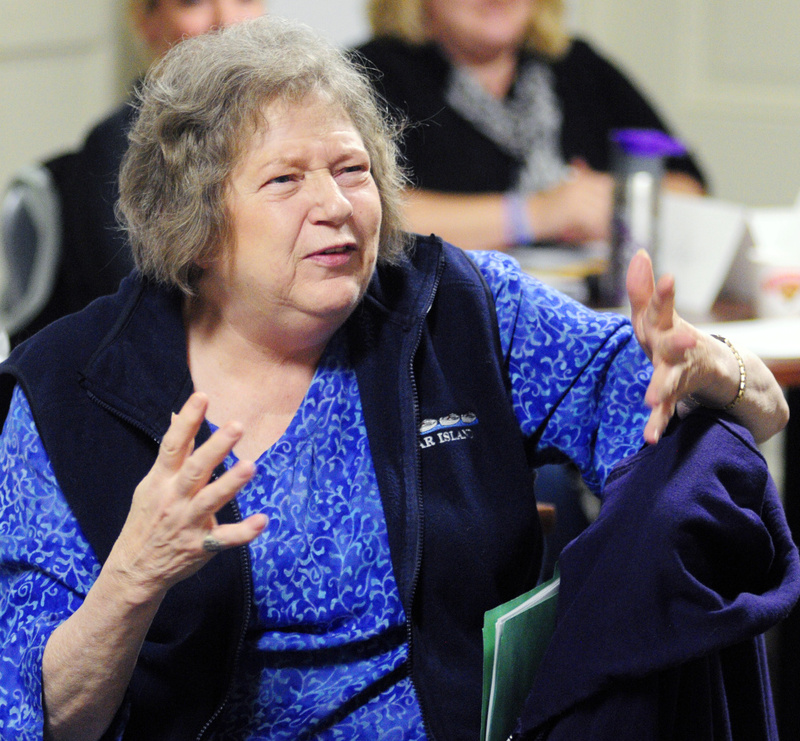 Catherine Brown of Gardiner volunteered after learning about the program from a professor at the University of Maine at Augusta, where she is studying mental health and human services. Lt. Chris Massey of the Augusta Police Department said the program will be geared to addicts who truly want help recovering. “You come to the PD with drugs in your pocket, I’ve got to figure you’re near rock bottom, if not there already,” he told the group during a brief introduction Friday. He also cautioned that the program is not yet available, and that the police would make a formal announcement of the kickoff date. Maine’s problems with opiate addiction are rising, according to an analysis conducted by the Office of Chief Medical Examiner for the Maine Attorney General’s Office, which issued numbers in late August. 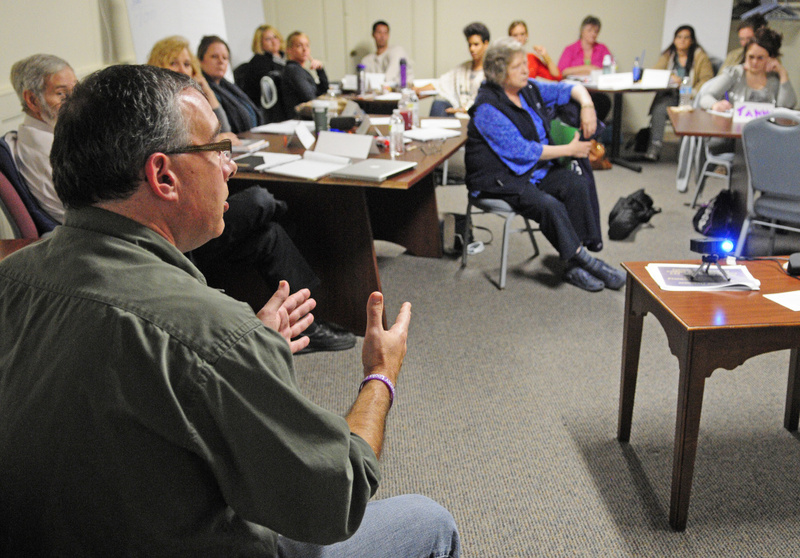 The recovery coach training was being offered by Darren Ripley, coordinator for the Maine Alliance for Addiction Recovery. The 30-hour program that began Friday is continuing over the weekend and will be held on Nov. 14 and 15 as well. He also provided some numbers that illustrate the need for the program. Two deaths have been linked to heroin overdoses this year in Augusta, he said, and an additional 16 people were revived when Augusta Fire and Rescue personnel used Narcan, an injectable substance used to counteract an opiate overdose. Massey cautioned that those 16 instances were the ones in which police officers responded as well and saw the actions of rescue personnel. He said there could have been other instances in which Narcan was used when police were not there. He urged anyone to report a possible overdose immediately by calling 911. “The longer you wait, the likelihood of revival decreases,” he said. Among the trainees Friday was former Augusta police Officer Raymond Moinester of Hallowell, who retired four years ago after 23 years with the force. He wants to help those going through recovery because it helps the police as well. Roberta Rolfe and Rachel Childs, both of Augusta, were taking the course to become recertified as recovery coaches. They said that being a mentor to someone in recovery generally involves about one hour a week with the person, and that the mentoring can last six to eight months. Childs, who works part time with Ripley, said she volunteered previously with for the Maine Alliance for Addiction Recovery in telephone recovery services.